I hope you had a wonderful Thanksgiving. I have a few Christmas gifts that will need gift bags so I decided to make a few of my own with materials I had on hand rather than going out and buying them. Here is a video on how I put together the one above :) I put to good use the little tags I made with the leftovers from my holiday cards. Let me tell you about our Thanksgiving. We had a wonderful time at my parent's house with my sister, brother and his family. You know how there is always one thing that goes wrong during the holidays...Wednesday the smoke/CO detector went off saying there is CO in the house...ugh...we called the gas company and they came out and checked to find no CO in the house. Yeah!!!! Thanksgiving day around 12:30 in the afternoon beep beep beep....NO!!!!! This time we left the windows closed like the guy the day before told us and called the gas company...he didn't find any CO either. He goes and checks the furnace and notices something is wrong and says...I can't leave you like this...we're going to have to shut it down...WHAT!!!! so to make a long story short this poor/kind man stayed for two hours Thanksgiving day and managed to temporarily fix our furnace so not to have to leave us without but we will have to have it replaced. Luckily our faulty detector went off before something major happened. On the upside it is the very last large expense that we knew we would have to do sooner or later in the house. At least it will be safe and we'll be toasty warm this winter. So that was my Thanksgiving holiday, we didn't let it ruin our family time and we already have three estimates in the works for the new furnace. Friday mom and I did some major xmas shopping. We started out at 5 am Friday morning and shopped for almost 9 hours. We are happy to report that we are done and ready for gift giving. Just need to wrap those presents. The tree is up and the house is decorated, let the holiday begin. Such a sweet bag. And so creative. I just love watching your videos. Just beautiful, thank you for sharing these tips. I just look so forward to your videos. Just beautiful. Thanks for showing how to do this bag without the die. Sometimes I see ideas, but they are with a die that I don't have and this helps so much that you did it with out the die. TFS! Tried sending you an email but not sure it went. This was the message. I've been following your blog for several years and thoroughly enjoy your videos. I am a visual learner and your videos are the best. I need to ask a favor. I've recently purchased Adobe Photoshop Elements 10. Not only do I want to be able to fix photos, resize phots, do collages but maybe eventually do some digital scrapbooking. But I'm struggling to learn Photoshop. I'm wondering if you might be able to recommend a online source for learning photoshop. Thank you in advance for your assistance. So relieved your furnace situation was detected and you will be safer going forward - what a blessing it was found!! Love this bag! Will be trying it myself. Thanks for your gifts of teaching and crafting! Really love your bag. Thanks for showing a different way to create it. I love the bag,but I love everything you create! Christina this bag is awesome! I appreciate that you took the time to show us how to make it without the die because I for one, do not own the die and love how you made this. So thank you! As for your Thanksgiving, at least you know now that the furnace needs to be replaced and as you said, it was caught before something "bad" could have happened. And way to go on your shopping! I have started a bit, I have a layaway on that I am picking up next week but I still need to do a little bit more shopping. My tree is up too but more decorating will come this weekend! Have a great day! 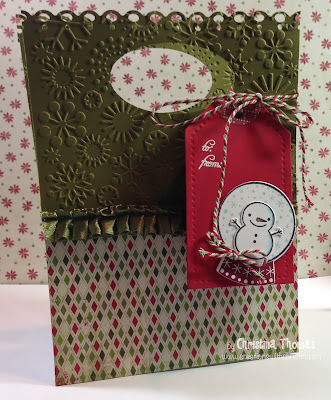 What a great tutorial, and the bag is lovely. Thanks again for all your inspiring videos.